There is always that awkwardness when the guests are seated but there is a delay... usually the bride is not ready yet. To keep your relatives & friends entertained (and not heading back to the bar for a quickie before the ceremony), consider these fun wedding programs. Usually a boring wedding program has your names, your parents names perhaps, and a schedule of events during the ceremony... really, no one cares. They know you are getting married and the don't really care when you light the unity candles or when your Uncle Jane will read 1st Corinthians. They aren't really following along anyway... and after all the time and expense you put into these programs. 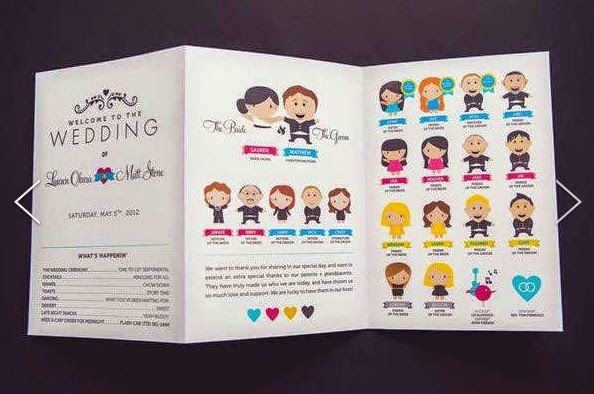 An informative and fun program like this will not only give your guests a chuckle, but also allow them to see your family members in fun characterizations and know their names and perhaps have something to talk with them about during the reception.